BMW of Germany recently held its “BMW Group Innovation Day 2012” at which they previewed and ballyhooed some of the new technologies they are working on. It was billed as a show of Efficient Dynamics and the intent to save energy throughout the vehicle. The company is spooling up to introduce a variety of battery and hybrid vehicles, and of course the engineers are concerned about making every kilowatt of battery energy available for propulsion. This means reducing other electrical loads throughout the car, and the power required for HVAC systems is getting a long look. One system being investigated is a heat-pump, in which the air conditioner is used to heat the car in a fashion identical to heat pumps used for homes. The engineers claim that an efficient heat-pump system in a car can provide energy savings of close to 50 percent compared to using an electric heating element to heat air in the cabin. Naturally, that’s of particular interest in cold climates, where sub-freezing temperatures can quickly sap a battery pack’s capacity. Additionally, the company is also investigating an infrared (IR) or radiant heating system. They note that conventional heaters and air conditioners heat the air in the vehicle which then transfers the heat to the driver and passengers. But infrared heating converts source energy into infrared radiation which then warms the occupants directly. Testing shows that these systems can become effective within one or two minutes after start-up, and the heat is distributed without fans or air currents. Additionally, new developments in the field are producing surfaces (rather than individual elements) to produce the heat. 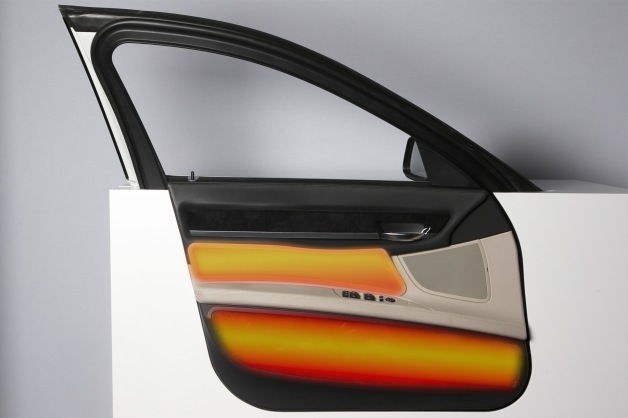 These IR “surfaces” could be incorporated into door panels, roof liners, or other panels to produce radiation closer to the occupants and to provide individual temperature control as well. BMW did not provide information on the wattage necessary to power the panels, but the elimination of both a resistance heating element and operation of the blower fan has to be a plus in the energy equation. You can E-mail us at macsworldwide@macsw.org or visit to find a Mobile Air Conditioning Society member repair shop in your area. Click here to find out more about your car’s mobile A/C and engine cooling system. This entry was posted in aftermarket career week, Automotive, Automotive training, Mobile Air Conditioning and tagged #air conditioning, #BMW, #efficient dynamics, #MACS Member, #Macs worldwide, car, car care, car care news, car care news service, car repair, professional service. Bookmark the permalink.